Making a Reservation: Contact us or visit our "Bookings" page to check availability of dates. To reserve a booking, a non-refundable deposit of 25% is required. On receipt of deposit, the booking will be confirmed. Balance of payment to be paid in full, 4 weeks prior to Arrival Date. Bookings within 4 weeks of Arrival Date are payable in full. By making a booking, you accept these Terms and Conditions on behalf of all the members of the party. You also accept responsibility for paying for the account for the whole stay. You must be at least 18 years old at time of booking. Arrivals & Departures: Bramble Cottage will be ready for you by 4pm on your Arrival Date, and the property must be vacated by 10am on Departure Date. Please make your way to Main House – Penkaet Rigg on arrival, where you will be welcomed and taken to Bramble Cottage. Any arrivals after 5pm should be notified in advance. Cleaning: Bramble Cottage should be left clean and tidy on departure and any damages must be reported prior to departure. Property left in a dirty or inappropriate manner may result in an additional cleaning surcharge. Pets: No pets allowed on premises. Smoking: No smoking on premises. Damages: All damages and losses will be charged in full. Footwear: The floor in Bramble Cottage is wooden. We respectfully request ladies please refrain from wearing stiletto heels or similar to avoid damage. Likewise, gents metal on footwear. 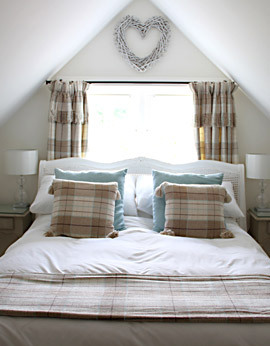 Occupancy: The occupancy of Bramble Cottage will not extend beyond the number of nights stated on your booking form. Unless otherwise agreed with the Proprietor in writing, the maximum number of guests in the party will not exceed two (2). Vehicles/Personal Property: As well as Cancellation and Curtailment Insurance, you are recommended to take out Holiday Insurance to cover loss or damage to personal effects. The Proprietor will not be responsible for any loss or damage or any injury to persons not caused through the fault of the Proprietor. Holiday Protection: To minimise the cost and inconvenience of cancelled bookings, you are advised to take out Holiday Insurance. You may have to forfeit the full cost of your holiday in certain circumstances. Restriction on Rental: The Proprietor reserves the right to remove person or persons from Bramble Cottage due to unreasonable behaviour, damage to the property or exceeding the stated occupancy as recorded on your Booking Form. In this case, refund will be at the sole discretion of the Proprietor. Bramble Cottage is to be used for the purpose of a holiday let to which Section12 (2) and paragraph 8 of Schedule 4 of the Housing (Scotland) Act 1988 apply. The booking agreement confers a right to occupy the accommodation for the agreed period only. Adverse Travel and Weather Conditions: Where there are disruptions due to bad travel or weather conditions, the Proprietor will not be held responsible for non-arrival at the cottage and no refunds will be given. The sole exception to this will be if the Proprietor deems the private access road, prior to your arrival to Bramble Cottage, impassable due to heavy snowfall where, in this case, you will be informed via your telephone contact details, and a full refund will be supplied. You will have no further claim against the Proprietor. Cancellation: If you require to cancel a reservation for any reason, the Proprietor must be notified by telephone immediately and cancellation must be confirmed in writing/email within 5 days. In the event of a cancellation, the Proprietor will make every effort to re-let the booking and if successful, you will be reimbursed in full. However we strongly advise that you take out insurance cover, as previously noted, to prevent the following additional costs. More than 6 weeks before your Arrival Date, your deposit will be forfeited. Less than 6 weeks before your Arrival Date, you will be liable to pay the full cost of rental (i.e. deposit and full balance). Availability: Each booking is made in good faith, with the belief that Bramble Cottage will be available to you on the date stated. If for any reason due to circumstances out-with the Proprietors control Bramble Cottage is not available, the Proprietor is unable to guarantee provision of alternative accommodation. In the event of this happening, the deposit and full balance will be refunded in full. You will have no further claim against the Proprietor. To improve the amenities within the cottage, the Proprietor reserves the right to alter or amend the facilities made available at Bramble Cottage. Parking: During your stay, exclusive parking for guests, contained within wooden fence and gated boundaries for Bramble Cottage, has been set-aside within the Main House grounds. Please note that any parking out-with this area is strictly prohibited, as occasional through-access may be required by horses and landowner to the forest beyond. The Proprietor will not be held liable or responsible for parking out-with the aforementioned area. Contract: When you submit a booking via our online reservation system you will receive an automatically generated booking summary by email to the email address you provide in the booking form. This does not form a contract between us. A contract shall only arise when your booking is subsequently confirmed in writing via a letter of confirmation sent to you by post or email.